Waaaay back in 2015, I wrote a little blog post on my desire to find, try and review ready made zero waste plastic-free make up options. So far, I've located this brilliant cheek and lip tint packaged in compostable cardboard. My next quest was for mascara. I've tried MANY different mascaras over the past year and a half. Finally I have one that I'd happily recommend. Apart from scrutinising the packaging, other considerations include ingredients, consistency, ease of use, drying time and how my lashes look. 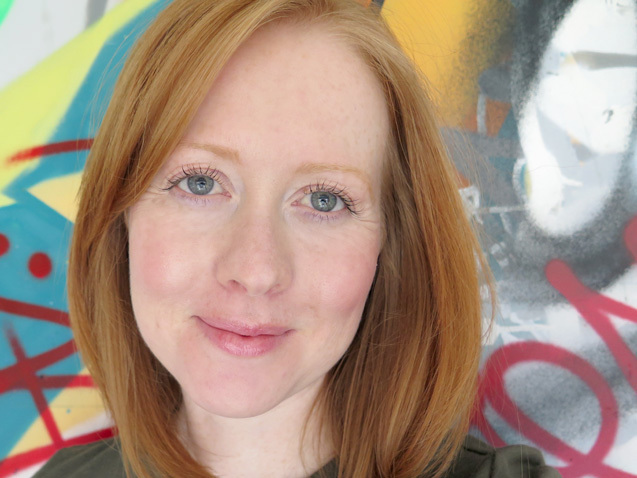 KeepingItNatural Zero Waste Cake Mascara ticked all the boxes. 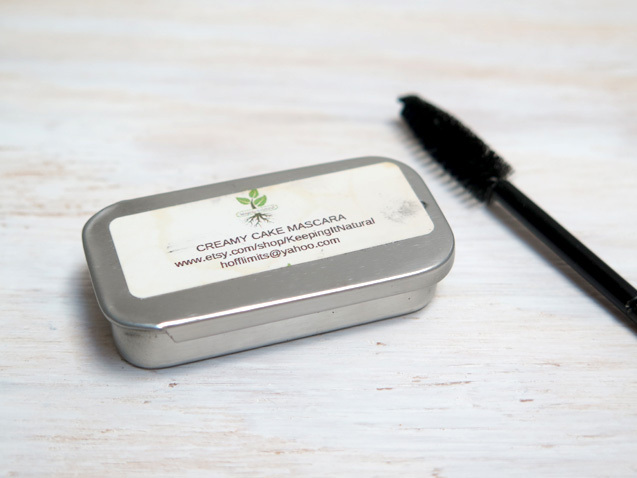 KeepingItNatural Zero Waste Cake Mascara comes in a metal tin. You can see from my photos the mascara has been used quite a bit – a good sign that I LOVE it. The consistency is smooth making application easy and does not clump on my lashes. I like that it is not heavy and can be layered to a desired intensity. Some mascaras don't allow that. I find that my lashes need two layers of KeepingItNatural Zero Waste Cake Mascara. I never used to put store bought mascara on my bottom lashes as it always looked overdone on me. KeepingItNatural Zero Waste Cake Mascara is light enough to put onto my lower lashes without it being to dark. But if you like a more dramatic look then it can be layered to suit you. Mascara that dries is crucial for my long eye lashes. When I look up, my lashes hit my eyelids. If the mascara is not dry it will leave dots and lines on the skin. This mascara dried quickly. Perfect. I've been using cake mascara for a while now, so I was familiar with the process. For those with no idea how it works, I can assure you the process is easy. Take a mascara wand, wet with water, run wand over cake mascara coating the brush and apply to lashes. You can see how it looks wet in the photo below. I had no trouble applying the mascara or removing it from my lashes with water. This cake mascara comes with a mascara wand, but you can request for no wand to be sent. The lightweight container is compact measuring just 5cm by 2cm. KeepingItNatural encourages customers to return the packaging for refill. 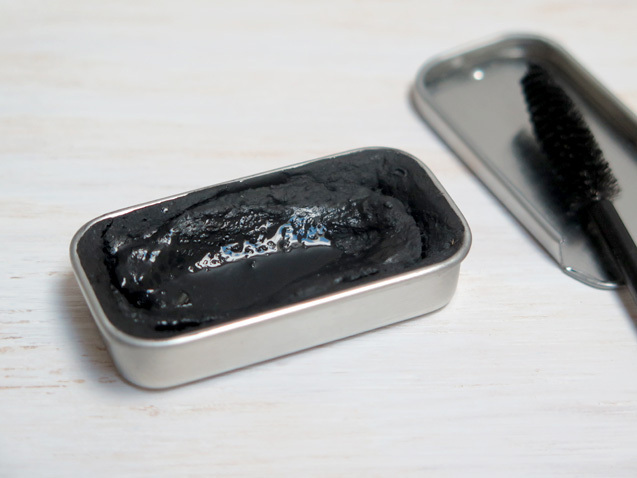 The tin can also be kept for reuse to make lip balm, cuticle cream, hold bobby pins, sewing pins and no doubt many other things that my mama brain can't think of right now. Metal has a high recycling rate as it's a sought after material. Unlike other recyclable materials, metal can be recycled almost continuously. 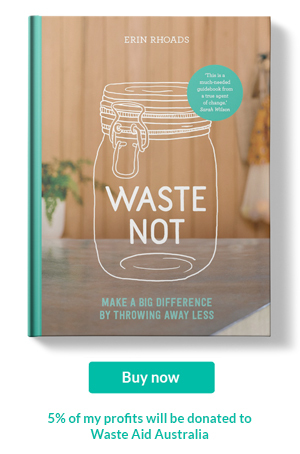 While recycling is a last step on the zero waste ladder, sometimes it's the best option for a certain situation. If you are like me who is not wanting to give up something like mascara and don't want or have time to make your own, then it's important to consider the longevity of the packaging material and if and how it will be recycled. 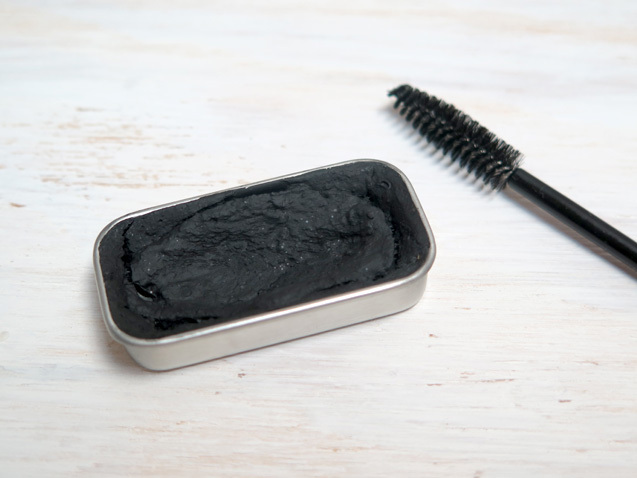 Plastic mascara tubes and wands can be recycled through TerraCycle, however they are more likely to be down-cycled. I'd rather pick a material that had a longer life, allows ease for refill and reuse like this metal tin. If you live in Australia and decide to buy this mascara, perhaps we can collect all the empty tins together to post back for reuse in bulk. I have been using the same wand for my mascara the past few years now. I wash it after each use before transferring to a small cloth pouch. If you have an eagle eye, you'll notice the wand I'm reusing is not the same as the one in my homemade cake mascara recipe. That's because a certain someone knocked my old one down the drain. Lucky a friend gave me her old mascara wand from a mascara tube she was sending off to TerraCycle. Now to the ingredients. I prefer any ready made makeup products to have a small number of ingredients and to also have a low ranking on the EWG Skin Deep website. So I was happy this mascara had less than ten ingredients and no nasty chemicals. KeepingItNatural Zero Waste Cake Mascara is vegan, free of parabens (synthetic hormone disrupting preservatives), fragrance and not tested on animals. KeepingItNatural will happily ship with no plastic in a plain envelope.